While Axis and FLIR have loudly proclaimed steep drops in thermal network camera pricing, their cameras are still at least $3,000 and most are far more expensive. Now, a newer entrant to the security market, DRS Technologies, has radically slashed pricing, offering similar cameras for less than $2,000. In this note, we examine who this company is, whether they are for real and what catches or limitations you may face. 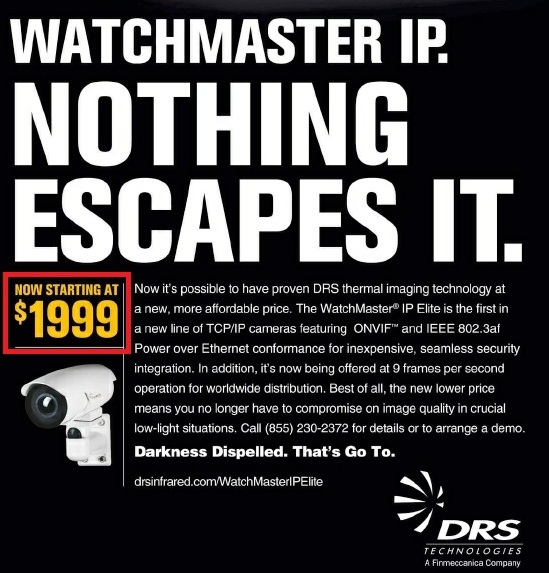 Last year, DRS released a network thermal camera line called WatchMaster IP Elite which we reviewed at that time. The sub $2,000 pricing is for that existing line, with no functional changes in the product offering. An interesting question is how DRS can drop their prices so steeply on an existing product. DRS says that since they manufacturer their own components, they have more price control than competiors using OEMs and more opportunity for economies of scale. However, given the depth of the drop, we believe that DRS must also be accepting lower margins to drive market share growth. It is available now, starting at $1,999 USD MSRP with a 40º lens. Given approximate discounts (between traditional security dealer discounts and lighter IT-type discounts), street price may be slightly lower. DRS sells through integrators only, with no direct sales nor distribution. DRS as a company: DRS is new to the commercial security space, only entering about 2-3 years ago. However, DRS has significant history in the defense sector, founded in 1968, lessening the impact of the commercial division's relatively recent founding. 3rd Party integration: ONVIF is the only integration method supported, which many integrators may see as a problem. DRS says they are working with many VMS providers to develop direct integrations, though you would need to check with them to see the status and timetable for your preferred one. Technical Support: Tech support is an integrator concern with any new entrant. DRS reports their tech support is available 5 days/60 hours per week. Turn around time: DRS tells us that most orders are shipped within 24 hours, but longer lead times may occur for larger orders. Given these prices, the WatchMaster is less than half the price of competitors. No Video Analytics: Unlike Axis, however, DRS' cameras are not capable of running analytics on-board, only motion detection. This is an important limitation as analytics are often run with thermal cameras. While DRS can support analytics, it needs to be done on the server side, increasing cost and complexity. Built-in IR: The first option is using cameras with built-in IR illuminators. This provides megapixel resolution and color during the day, unlike most thermal cameras which are limited to 320 x 240 resolution Built-in IR is generally limited to 50-60' at most, whereas thermal cameras often have detection ranges in the hundreds of feet. Integrated IR cameras are typically priced well below even the WatchMaster, however, selling for $1,000 or less. Long-range external illuminator: The second option is using a long-range illuminators, which may reach ranges close to the detection limits of thermal cameras. However, these illuminators alone often sell for over $1,000 each, and must be separately installed and integrated with the IP camera. Further, high-powered IR also causes overexposure in the near field, making nighttime identification difficult. No matter which form of IR is used, thermal cameras have an advantage in fog or inclement weather, as well, as they are better able to ignore these effects. However, thermal cameras means giving up high resolution daytime color images, a major barrier for many users. One could complement these lower cost thermal cameras with a standard megapixel cameras at a modest increase in cost to rectify this shortcoming.